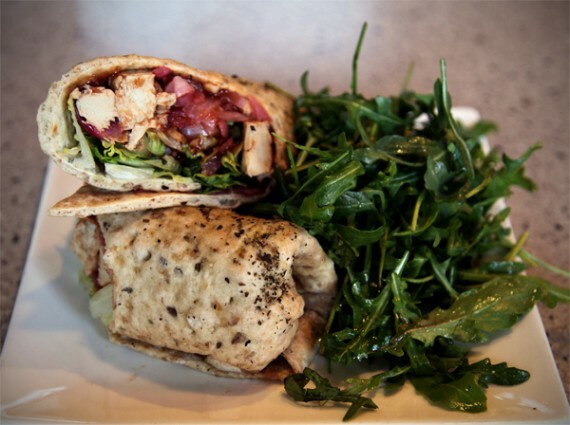 quarrygirl.com » Blog Archive » VEGAN BEER FLOATS & new wraps at pizza fusion hollywood! it’s filled up with tons of nice things including romaine, arugula, carrots, tomatoes, cucumbers, red onions, and soy cheese….all in a smooth tahini dressing. 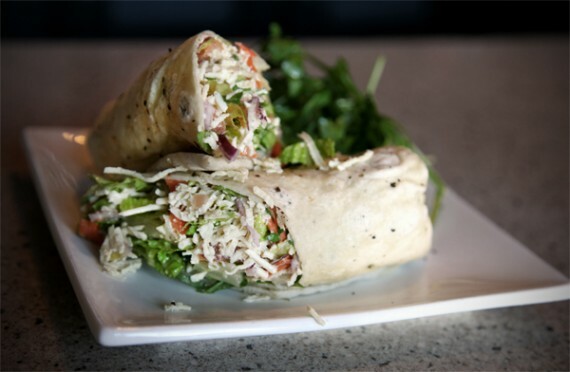 it’s served in your choice of regular or multi-grain wrap, and comes with a fresh arugula side salad to make a complete meal. i ordered mine in a regular wrap with daiya (rather than soy cheese), and it was fantastic. light and crisp with loads of crunchy vegetables, and a cool creamy finish. the bread/wrap thingy itself was phenomenal…and i found out it’s actually the pizza fusion crust, stretched thinly and dusted with herbs. way better than any tortilla or flat bread i’ve had in the past. i also tried the bbq chicken wrap (made vegan), which comes with gardein “chicken”, bbq sauce, roasted red onions, soy cheese, fresh garlic, basil, and romaine. i ordered mine on multi-grain with no cheese, and i’m happy to report that it’s probably the best wrap i’ve eaten in my life. the little chunks of gardein were plump and perfectly juicy, and the sweet onions were fantastic all mixed up with the fresh garlic and tangy sauce. again, the bread was simply amazing! it didn’t taste at all like pizza crust…i have no clue how they do it. i live pretty close to pizza fusion hollywood, so this may be my new go-to lunch option. OF COURSE, i had to order a beer float as well. i don’t know of anywhere else in los angeles to get a vegan beer float, and i’d never had one before, so this was a real treat. 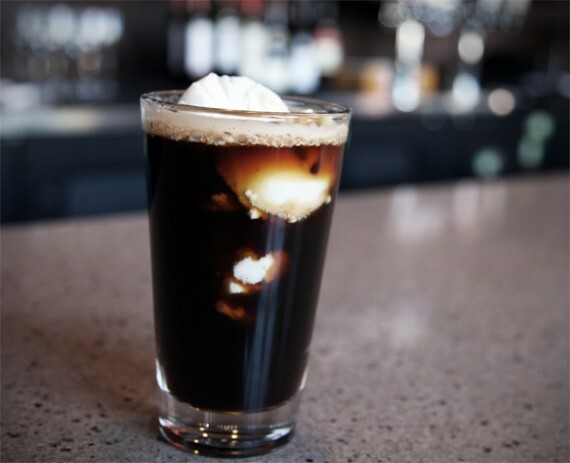 pizza fusion uses bayhawk ales’ chocolate porter along with a creamy locally-made coconut sorbet. absolutely epic. the ice cream is ridiculously delicious and doesn’t even taste vegan. it has that “milky” texture, with little bits of toasted coconut scattered throughout. it went down so well with the dark, rich, chocolatey beer. absolute HEAVEN. i’m so excited that pizza fusion hollywood has been adding all these new vegan options to their menu, and i can’t wait to go back for more wraps and beer floats. this stuff is so freaking good…don’t take my word for it. you really need to taste it for yourself! 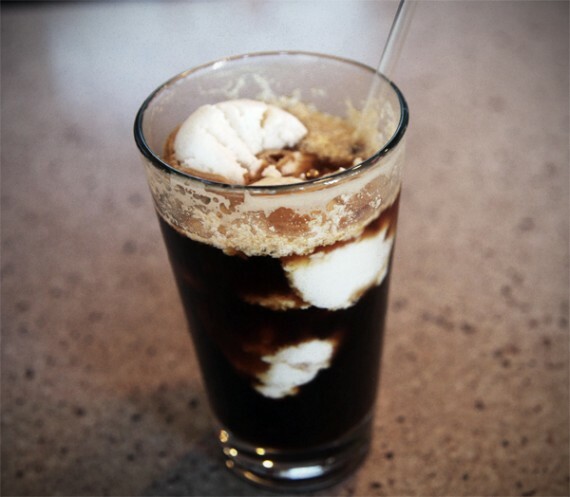 VEGAN BEER FLOAT? OMG. I’m going there today. 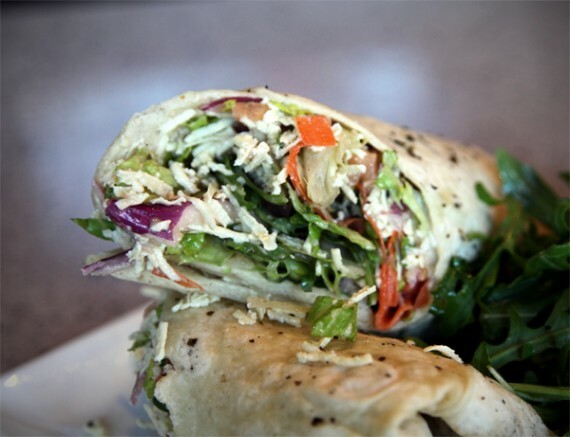 The vegan wrap looks scrumptious; wonder if they could make it with the gluten-free pizza crust. Perhaps they will eventually add the wraps to their online menu and clarify this. I sure do love the Very Vegan Pizza with Daiya on the gluten-free crust! I’ve been hoping Golden State would start getting vegan flavor from Scoops for their beer floats so this is awesome! Soo excited to try that. I just went to Pizza Fusion last night for a casual Valentine’s dinner with my boyfriend (thank you for alerting us to the specials!) and it was fantastic. The vegan cheesy garlic bread was heavenly. Our server said they are trying to convince management to add it to the normal menu. The only bummer was that they were out of vegan chicken so we could not try their vegan bbq chicken pizza as we had planned. We got the special vegan love fest and it was very tasty. We also loved that the server brought out both red pepper flakes and garlic salt with the pizza. A little sprinkling of the garlic salt was crazy good. Of course we also had to get the heart shaped brownie ice cream sandwich with the coconut sorbet inside and it was both adorable and delicious. I really love that they actually mark on the menu which wines and beers are vegan and we happened to be there during happy hour so we got a great deal on some wine. As you can probably tell from my rambling we had a great time and highly recommend it! That wrap looks so delicious!!! On the docket for this weekend. So curious to see if the BBQ wrap will top the pesto, hummus, avocado, soy chicken and sprouts wrap at Green Leaves as my favorite wrap of all time. I mean Green Earth in Pasadena. D’oh!